I started gaming as a snotnose kid back in the 80's. Over the years I've talked to a lot of gamers and past gamers who started as snotnose kids back in the 80's and most of the time I hear much the same story from them. We generally all started out with either the '81 or '83 Basic D&D rules. I started with Moldvay's near-flawless '81 edit but at least as many, if not more, got on the bandwagon with Mentzer's even-better-for-newbies '83 stuff. At some point thereafter the existence of Advanced Dungeons & Dragons became known to us. We were all dumb kids in a hobby clearly originally aimed at a much older and more sophisticated audience, so we of course all had to get in on this 'Advanced' stuff. The immediate problem, of course, is that AD&D was a LOT more game than Basic/Expert D&D, with a lot more fiddly bits. So we basically lied to ourselves. My group said we played AD&D. We had the AD&D books at the table. But whenever we found a mechanic we considered too cumbersome, we ignored it in favor of D&D as Tom Moldvay had taught us. AD&D initiative? Forget it. We used Basic D&D's super-simple group initiative rules. Material components? Naw. Our Basic D&D m-u's could cast spells without components, so why should our Advanced guys be saddled with that crap? I'm painting with a broad brush here, but basically for an entire generation of D&D kids we tended to play Basic D&D but bolted on the bits from Advanced that we liked. More class and race options? Sign us up! Higher level spells? We'll take all you can spare! Two-handed swords that do an amazing 3d6 damage against big dudes? You know we want in on that action! So this is where maybe OSRIC and Labyrinth Lord and such are missing the boat. As I recently proved in my own gaming group, not that many gamers want to play AD&D 1st edition as written. Hell, in a quarter century of gaming I've only met one guy that claimed his group played 1st edition AD&D exactly as written. On the other end of the spectrum, Basic/Expert type D&D can be a little too simplistic for some people. That goes right back to why my group and so many others hybridized the two games: we wanted to pick and choose a level of complexity between the two published extremes. Changing gears for just a moment, is everyone familiar with 0one Games? (I think that's supposed to be pronounced "zero one" but I always want to say "oon".) They make some of the best dang maps you can buy. Their Caverns of Chaos is a gorgeous and utterly gameable homage to the original Caves of Chaos. And if you always wanted your own megadungeon but hate mapping, you really need to check out their series of super-mega Under the Mountain level maps. 0one is part of the YourGamesNow collective, which is a fabulous place to get gaming PDFs. At least some of the 0one maps come with this great feature called "Rule the Dungeon!". You open up the PDF and it comes with these little clicky buttons. Let's say that the map is in color but you want to print in black & white. Click the right button and the color layers are hidden. If you like the map, but think the furniture in the rooms won't suit your uses, you can click to basically turn the furniture off. The basic layout of the map is always the same, but you can customize the presentation for your own specific needs. THAT is what I want from an OGL D&D pdf. Total effin' customizability. Give me a bigass checklist in the front of the file, like the ones that you can find in the back of old RoleMaster Companions. Allow me, through judicious checking and unchecking of little option boxes, to drill down to the exact version of D&D that suits my tastes. Give me the option of typing in additional text, or have the output of the program be in a form that I can easily edit. Then I can print out a copy for each player in a campaign and I will know that we're all on the exact same page. Somebody, please, steal this idea and run with it. Everybody already runs their own version of D&D. We're finally within reach of technology that should allow us to easily share our personal D&D's with all the other fans of the game. Yep, that about sums it up. My starting experience with D&D as another 80's kid was a mishmash of Moldvay, Mentzer, and AD&D- and like you said the big things we used from AD&D were classes- Barbarians, Samurai, Assasins, Paladins, etc. And of course monsters. Wow, that is a great idea. If only I had the talent to pull this off! Seriously somebody should take the ball and run. I know I would buy it. For all the crap Purists tend to throw at Castles & Crusades for "failing" them, to be truthful the game does just what you said - it cherry-picks nice little tidbits from various iterations of D&D, adds on the Primes & Challenges mechanic to give a basic but easily playable "roll for something other than saving or fighting" mechanic, and there you go. As a system, I think it's quite nice (although I immediately ditched their weapons and armor rules/descriptions). Another system that takes similar crap is the Basic Fantasy RPG, because they do things like use ascending armor class values and the like. Again, this fixation on Purism in the retro-clone debate is rather amusing because like you said - almost no one played Purist versions of those games anyways! Jeff, this is a really good idea. On the "we started with basic D&D" trope -- my sister handed down her Red box D&D Basic Set to me, I read through it a little bit, and did nothing with it. The game I actually started with was TMNT. The first D&D game I ever actually used was AD&D 1st edition (given to me by one of my sister's boyfriends), followed closely by Oriental Adventures. When I actually looked at D&D in depth, I found it quirky and weird in comparison with the AD&D I'd really started with as my first D&D incarnation. "What do you mean Elf is a class? That's goofy." "What do you mean my first-level Cleric has no spells? What's the point of that?" Following my recent shelf purge, I've retained the D&D Cyclopedia, which appeals to my "all in one book" love, and a handful of 1st edition AD&D books. I have no real nostalgia for any of these books, but they're nice to have around. I had a D&D B/X moment in my last 1st Ed. game. For the last two years (and forever before that as far as I know) I had been making them roll 1D6+1 for Cure Light Wounds. Someone finally checked the Players Handbook and found it was 1D8 - I don't think I had ever realized that - Then I checked the potion of healing (I had also been rolling 1d6+1) and I realized I had been doing that wrong too though both were right by Basic D&D. My appreciation for D&D is entirely retroactive, I'm sorry to say. In my own gaming youth in the early and mid-1980s, the groups I learned from were AD&D hardcores, and never went near the "kiddie game" in any way at all; it was entirely taboo at the local gaming club. 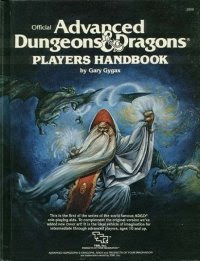 It wasn't until the late 80s that I sat down with some Basic and Expert and decided that it was pretty much 100% the D&D I had always wanted but never had ... I regret that this led me into a period of AD&D backlash which was never fair (for one thing, AD&D had the Fiend Folio, which I still regard as one of the finest books ever published in the hobby's history, and the only D&D monster book I retain a really glowy admiration for). Anyway, I got over that. I go the other way on complexity. I start with Basic D&D and pare away all those rules labeled as optional at any point (including Encumbrance and variable weapon damage). I run some D&D pretty regularly nowadays, and them's my rules of choice. Coincidentally, I'm working on a random dungeon generator at the moment for Tunnels & Trolls, which gives you a series of options at the start. It's a lot easier for that system though, because there are less differences between different editions. That's pretty close for us. "AD&D lets you have percentile strength! And assassins!" But there is quite a bit of overly complicated stuff (compared to the amount of benefit) in 1e AD&D. You know, with some server-side scripting & a database this could be pretty easily done. Especially with PHP, which has some PDF functions built in. Figure out what the various choices are, the possible values for each choice, then present the user with a menu of choices - click this for no cleric spells at 1st level, this for nine alignments, this for RC druids/this for AD&D druids, & so on. Once all the choices are made, click another button & shazam! A tailor-made PDF of D&D your way. @trollsmyth - Y'know, that's really any harder. With a series of blank spaces for illustrations, there could be a set of pictures in each style; depending on the user's choice, the book would come out illustrated as desired. Now finding an illustrator who can work in each style & would do it for nothing but karma, that would be tough. Argh! That should have said "not any harder." I just wish there was an option to remove the crappy bits that never seem to get removed no matter how many iterations of the game I go through. Things like the Wisdom stat. What does it even mean? It makes no sense to have two different stats that both translate to "smarts". Dexterity has problems too, with the way it means sometimes manual dexterity, sometimes speed, sometimes agility etc. Yet nobody who has set out to make a "like D&D but better" has seen fit to throw away the crappy six base stats and create a better thought out list. - Spell memorization. It's just dumb extra work that doesn't improve the game at all and reduces the usefulness of many fun-but-narrow spells to nothing. Just say that wizard X can cast so-and-so many spells of level so and let them be picked on the fly. - Saving throws. There's no point in them, a simple ability check does everything a saving throw does. You already have a stat that tells you how tough you are (Constitution), there's no point in having another stats for testing whether you can out-tough hazards. - Strength should not help you hit more accurately, and armor should not make you more difficult to touch with an attack. - Why roll an ability score at all if you're only going to use the modifier? Just have them roll the modifier and write that down ("my strength is -2") or change the system so that stats, not modifiers, are used for things. - Try to make up your minds whether hit points are health or luck, you can't have it both ways! More and more often I am realizing that very few of us ever actually played AD&D 1e back in the 80's. I came to this realization when I discovered the simple elegance of OD&D and the LBB, that we were only playing AD&D in name, and it was essentially OD&D in spirit, using the 'cool stuff' from 1e. As to the 0one stuff, I agree! Great adventuring template idea. Mrph. Guess the name will have to wait for later. Something like this was offered up for discussion with regards to Advanced Labyrinth Lord on the Goblinoid Games Forums. I just wonder whether offering discrete options would stifle creativity and perhaps even the freedom of DMs to modify the game uninhibited. 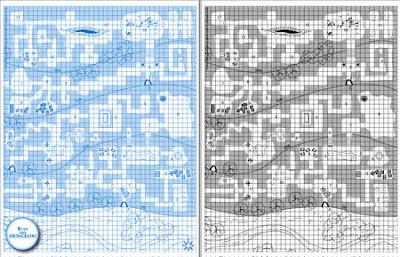 I love the pdf maps 0one Games has been offering; very nifty. I suppose you could lump OSRIC (cont speak for Labyrinth Lord) into the purist by the book crap but then that would make the admitted broad brush stroke into a behometh. I know there are a number of folks running about claiming they only play by the book or that you should only play by the book but OSRIC does not promote that stance. In fact, OSRIC was not published to be a game you actually played. It was in fact published as a writers tool and available license (free at that) so that people wanting to publish supplements and adventures for pay that were more easily compatible with certain out of print FRPGs could do so, legally. Why would one want to play OSRIC when the games that it pays homage to is widely available? Yes, some folks have picked up OSRIC and are now using it as a stand alone game. That's kinda cool. But how they choose to play is no more relevent to OSRIC as it was 1e or 2e AD&D or any other edition. As for by the book, we have played a few games of AD&D like that and it sucked. Of course when EGG told us all the stuff he cut out of the game when he ran it and the few things he added to it - well we all were a bit amused to find out our changes had been very close to his. In other words, when I hear someone say that they only play/played AD&D by the book using every rule from the PH, DMG, and MM, then I usually just smile and tell them their games must have been "simply amazing." Because I would be simply amazed to find anyone that actually plays or played every game, every campaign exactly 100% with no deviations - by the book. Although what I do agree with EGG about is that when it comes to AD&D 1e, house rules should be weighed very heavily and tested over and over again before they are made part of the game. Sure switching initiative dice between d6 and d10, or making a heal spell do a d6 instead of a d8 are not game breakers. Neither are dropping Psionics, weapon speed, weapon vs armor, and a number of little things. But it is much easier to drop rules that don't break the system than add rules that don't break the system. House rules are very doable but you need to be careful otherwise you end up with too much of an advantage for the characters or too much for the monsters. On the other hand, if someone really wanted to run AD&D 1e as close to the book as possible then I am all for it. This is after all one of the main reasons it was designed. Tournament Play. I am from the era that when I would go to a game convention (usually a historical miniatures convention with some one running an occasional OD&D game) we would have to take a lot of extra time trying to decide on who's house rules to use. If there was 10 of us then that usually meant 10 different sets of house rules being argued for. AD&D 1e was designed to eliminate this time waster. A solid set of codified rules that everyone would know, and with 5 mins of ok we drop this this and this and yeah lets use the d10 for init - lets play. OD&D was always the "developers" game. Even after the release of 1e EGG et al when asked would usually say 1e for tourney play, OD&D for your cut loose play. I think too many people over the years has forgotten that - or never have heard it/read it in the pages of the SR or the Dragon. Anyhow, just some thoughts and I what I hope will help clear up some misconceptions. The idea right now is to let users check from a menu of options, enter their own values in form fields, tack on houserules as they go, & choose to get the result as an RTF doc that can be edited after the fact. The premise is that this is something the DM would, as Jeff said, "print out a copy [of] for each player in a campaign [so] I will know that we're all on the exact same page". So plenty of opportunities for making selections & adding houserules, but no DMing advice (& maybe no monsters) because it's essentially a cheat-sheet for the campaign. Act Now to Win Fabulous RPG Prizes! One more comment on Kobolds Are My Baby! I am a villain of the basest sort. Look out! It's the wizard's ghost!